By Thoriq Firdaus in Coding. Updated on October 31, 2018 . The idea is simple, we will still be using SVG elements as the primary way to deliver graphics on our webpage, but at the same time we will also provide a fallback function so that it can be still rendered in unsupported browsers. Sure, there are many paths we can take, but we will only look into to two solutions that I think is a better generic solution. So, let’s see how we can do it. Apart from putting it directly into an HTML document, there are several ways to embed SVG. 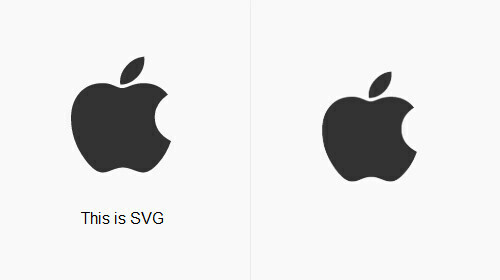 For instance, if we store the graphic in .svg file, we can use the <object> element. This way, supported browsers will still be taking the .svg, while the unsupported browsers will carry the Bitmap graphic. 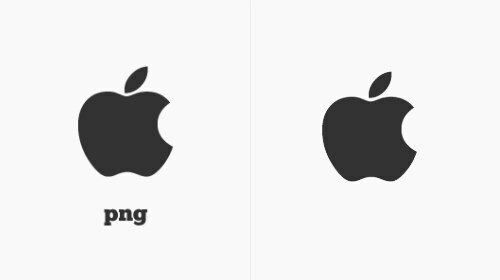 We have added the “png” mark below the Apple logo to track which graphic is being delivered. However, as we have mentioned in the other post, Bitmap graphics are not as flexible and scalable as SVG. So, let’s take a look at another solution. And for the other two files, raphael.js and svg.js, we will load it conditionally, only when it is viewed in unsupported browsers. In the code snippet above, we have added the SVG directly into the HTML document and a div to accommodate the Raphael code. Once again to be able to notice which graphic is being delivered easily, we have also put some text below the logo inside the SVG element. So, here is what we will get in the browsers. To see it more clearly, you can view the demo from the links below and make sure you try it in different browsers; we would suggest IE8/7 and Google Chrome. Alright, these are just a few examples, in particular cases they might not be that effective. But in general, these should do a favor to solve the problem on serving SVG in unsupported browsers. Lastly, if you have something to add that we’ve missed in this post, feel free to share it in the comment box below. Thanks for reading this post and we hope you enjoyed it.